A central aspect of life sciences is to explore the symbiotic cohabitation of animals, plants and humans with their specific bacterial communities. Scientists refer to the full set of microorganisms living on and inside a host organism as the microbiome. Over the past years, evidence has accumulated that the composition and balance of this microbiome contributes to the organism’s health. For instance, alterations in the composition of the bacterial community are implicated in the origin of various so-called environmental diseases. However, it is still largely unknown just how the cooperation between organism and bacteria works at the molecular level and how the microbiome and body exactly act as a functional unit. An important breakthrough in deciphering these highly complex relationships has now been achieved by a research team from Kiel University’s Zoological Institute. Using the freshwater polyp Hydra as a model organism, the Kiel-based researchers and their international colleagues investigated how the simple nervous system of these animals interacts with the microbiome. They were able to demonstrate, for the first time, that small molecules secreted by nerve cells help to regulate the composition and colonisation of specific types of beneficial bacteria along the Hydra’s body column. “Up to now, neuronal factors that influence the body’s bacterial colonisation were largely unknown. 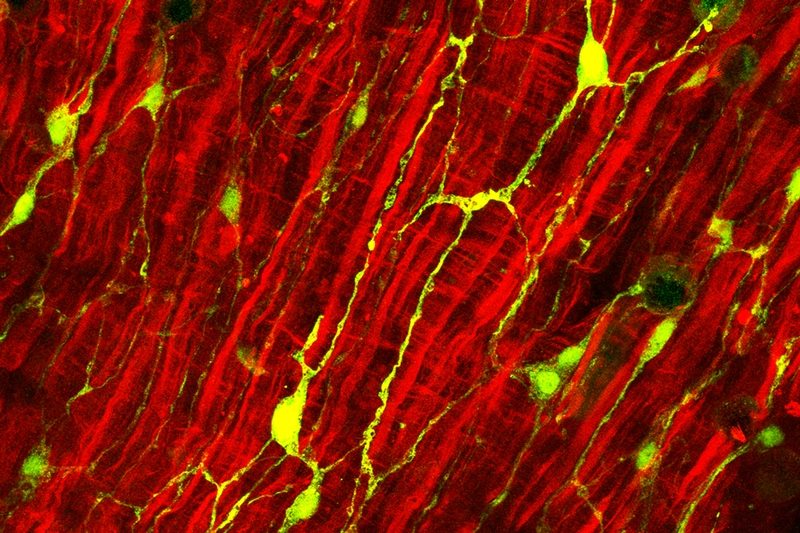 We have been able to prove that the nervous system plays an important regulatory role here,” emphasises Professor Thomas Bosch, evolutionary developmental biologist and spokesperson of the Collaborative Research Centre 1182 “Origin and Function of Metaorganisms”, funded by the German Science Foundation (DFG).The scientists published their new findings in Nature Communications this Tuesday. The simple structures of the freshwater polyp Hydra make it easier to research the interaction between the nervous system and the bacterial community. 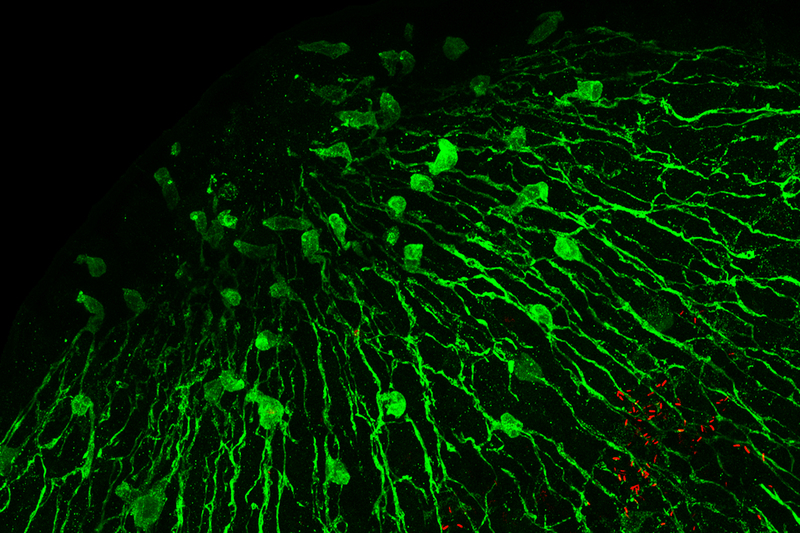 Fibres of intestinal tissue (in red) surround the nerve cells (in green) of the freshwater polyp Hydra.